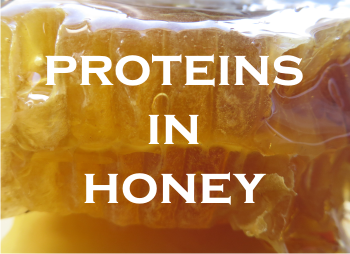 There is not such a high content of proteins in honey, but their role there is as important as the presence of proteins in any animal or human body. Proteins are large, complex molecules, vital for the normal functioning of the human body. For the laymen, a protein is like a string of beads or of pearls, where beads are amino acids, attached to one another by peptide bonds. Each string contains hundreds of beads (amino acids) and they are essential for the structure, function, and regulation of the body’s tissues and organs. Honey includes in its composition all the substances necessary to sustain life, including water, sugars, enzymes, vitamins, minerals, antioxidants like polyphenols and other phytonutrients. Even pinocembrin, an antioxidant associated with improved brain functioning. Honey composition depends a lot on the influence of plants, climate and environmental conditions and, of course, the skills of the beekeeper. The physicochemical properties of honey depend on the nectar and pollen of the source plant. There are big differences among different types of honey, especially between honey with blossom origin and honey from honeydew droplets. Also, very important are the processing and storage conditions. The content of amino acids and proteins is relatively small in honey, yet important in its overall composition. 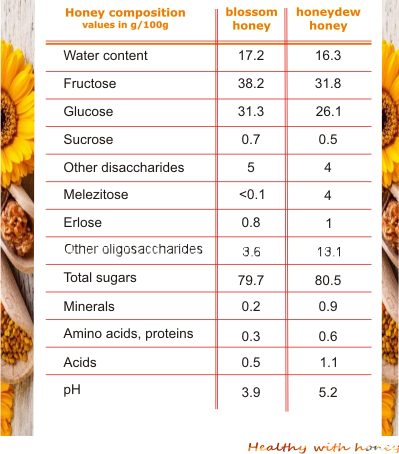 Generally the amino acids and proteins in blossom honeys are 0.3 g/100 g and in honeydew honey in an average of 0.6 g/100 g. But not necessary the quantity matters, but its diversity. A 2013 study reviewed the physicochemical properties as well as the mineral and protein content of honey samples from Ceará state, Northeastern Brazil. The researchers analyzed 22 samples of honey from different floral origins, made by Apis mellifera honey bee. The results showed that the protein content of A. occidentale (The cashew tree) honey was the highest, followed by the honey samples from M. urundeuva (a timber tree) and Ziziphus joazeiro (a small tree growing in the Caatinga of Brazil). The results are within the range established by the official methods used in Brazil. Azeredo et al. (2003) considered high protein contents to be those higher than 1000.00 µg/g and found high values of protein content in honey samples of Borreria verticillata (2236.00 µg/g), from Piauí, Brasil. Honey contains almost all physiologically important amino acids. The amino acids are up to 18 (of the 20) and are derived almost solely from the bodies of the bees. The main amino acid is proline. Proline is the main amino acid in honey, added by the bee, which also helps in measuring the honey ripeness (von der Ohe et al., 1991). Normal honeys have an average of 200 mg/kg. If honey has a value below 180 mg/kg, this will indicate an adultery of honey, by sugar addition. Yet, the proline content of honey varies greatly from honey to honey and it is not possible to classify unifloral honey on the basis of proline content only. The proline content is easily determined by photometry (Bogdanov et al., 1997). In Germany a honey with less than 180 mg/kg is considered as either non-ripe or adulterated. The other proteins present in honey are mainly enzymes. Bees add different enzymes during the process of honey ripening. honey directive. If honey is heated, this enzymes will decay, too. – glucose oxidase and catalase, which regulate the production of H202, one of the honey antibacterial factors. Read other details about which enzymes are present in honey and what is their purpose there: What are the enzymes present in raw honey? Why are they important? • A study conducted by Lee Suan Chua et al from Malaysia focused on the extraction and identification of honey proteins from Acacia, Tualang, and Gelam honeys from Malaysia. There are people allergic to honey. Not necessary at the pollen of a certain flower that they know to be allergic to, but simply to honey made from non-allergologic plants. While there are known allergens derived from bee proteins that have been identified in royal jelly and bee venom, we don’t know anything about their existence in honey. There have been 4 reported cases of honey allergy, and a team of Japanese researchers managed to study what triggered it using the serum from the 4th case. Takeshi HAYASHI et al., from the Faculty of Food and Nutrition, Beppu University, Japan, published in 2011 the study Immunological Characterization of Honey Proteins and Identification of MRJP 1 as an IgE-Binding Protein analyzed the IgE-binding proteins in the total proteins of some honey samples and performed immunoblot analyses with serum from a honey-allergic patient, the forth case of honey allergy detected in Japan. Berger and Hahn, 1972; Petrov, 1974; Bosi and Battaglini, 1978; Kanematsu et al., 1982; Speer and Montag, 1986; Pirini et al., 1992; Pawlowska and Armstrong, 1994; Bouseta et al., 1996; Conte et al., 1998; Cotte et al., 2004; Iglesias et al., 2004).